If you’re me then you think about food for quite some time every day. If it’s your birthday next week then you think about it even more, because there’s a lot to plan. What restaurant? What type of birthday cake? If you’re me you’re also terribly picky when it comes to what goes in your mouth and since your horizon is very broad and you know of many different types of cakes from different cultures it’s extremely hard to decide what type of birthday cake to make because it feels like there’s endless possibilities. If you then decide on something chances are that it involves an element that you have never made before so you need to make a small, simplified trial cake just to see if you can get that part right. Crazy? Obsessed? Yeah, that’s me. Last week I decided to try my hand at mousse again, this time a banana mousse. I’ve failed making mousse twice now so I was quite hesitant, but felt like you can only fail so many times. This mousse is a little more complicated than the usual melt chocolate-whip cream-fold together-type mousse that you might be used to, but it’s worth it and you’ll feel very proud of your achievement once you’ve finished it. The recipe is from Joe Pastry and apparently it’s a Bavarian cream. The quantities mentioned here makes half a batch, which was enough for my cake. 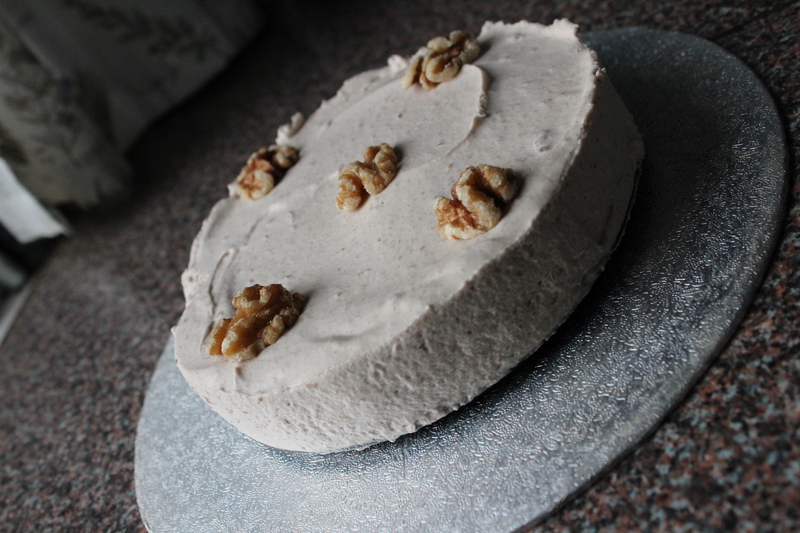 I used some leftover walnut sponge cake that I froze a few weeks ago. The recipe is my own and it’s a bit wonky and it tends to rise unevenly (although that might be because of the oven in this house). You’ll get more cake than you need from the recipe so you can just cut off a slice the thickness you want (about 2-3 cm I’d say is a good thickness) thus solving the problem with the cake being uneven and eat the leftovers or you can look around online for another recipe. If like me you love advanced French desserts with mysterious names you should really try making this cake. Whip the eggs together with the sugar until it’s light and fluffy. Mix the flour together with the baking powder and the ground up nuts and fold this into the batter. Fold in the melted butter and the chopped nuts. Pour the batter into a baking tin about 15 cm/6 inches diameter and bake in the oven at 180 degrees C/356 degrees F (165 degrees C/329 degrees F if you’re using a convection oven) until a skewer comes out clean. Mix the bananas and sugar together in a blender and add the lemon juice, strain the mixture. Put about a third of the puree in a saucepan, heat it slightly, add the gelatin and stir until it’s dissolved. Pour the contents of the saucepan in a large mixing bowl and add the rest of the puree, let it cool down, stirring every now and then. Whip the cream to soft peaks. Put the bowl with the puree in a cold water bath and stir until it gets thick. Whip the cream to stiff peaks and fold in the puree. To assemble the cake you grease up your tin with some oil, place the slice of sponge in the middle at the bottom of the tin and lastly pour in the mousse, spreading it as well as you can. Let it set in the fridge for several hours or overnight. 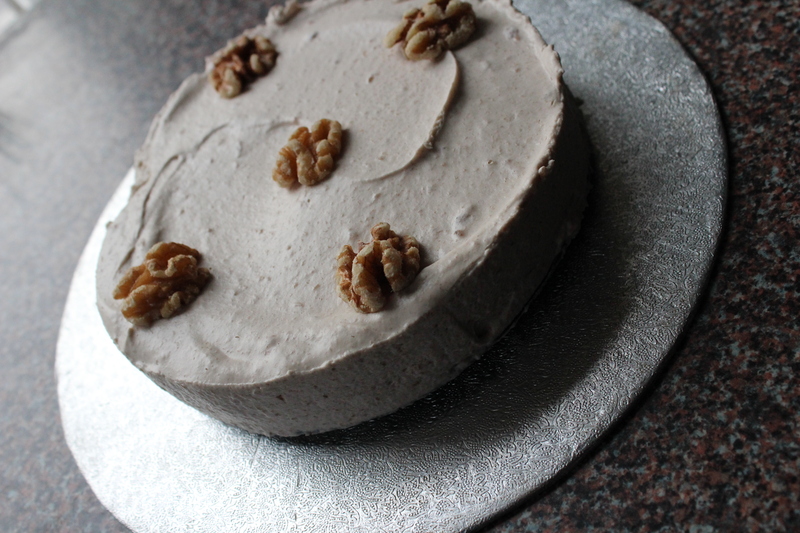 This entry was posted in Cakes and tagged banana mousse, bavarian, walnut cake. Bookmark the permalink.